Pools and Southern California are a natural pair. Los Angeles County alone has over 250,000 swimming pools! But having a pool on your commercial property comes with a great deal of responsibility. One of the strictest bits of legislation in the county deals with signage at and around swimming pools. But just because you need to be compliant doesn’t mean you have to compromise on the aesthetic of your pool and pool deck. Here at Starfish Signs, we’re experts in the laws and regulations surrounding pool signage, and we have many solutions to help keep your pool above board and looking great. The following signage is not required by California state law. However, many pool properties find these signs useful. Pool Rules—A list of rules specific to your association. This signage is often posted near the entrances to the facility and in the dressing rooms. 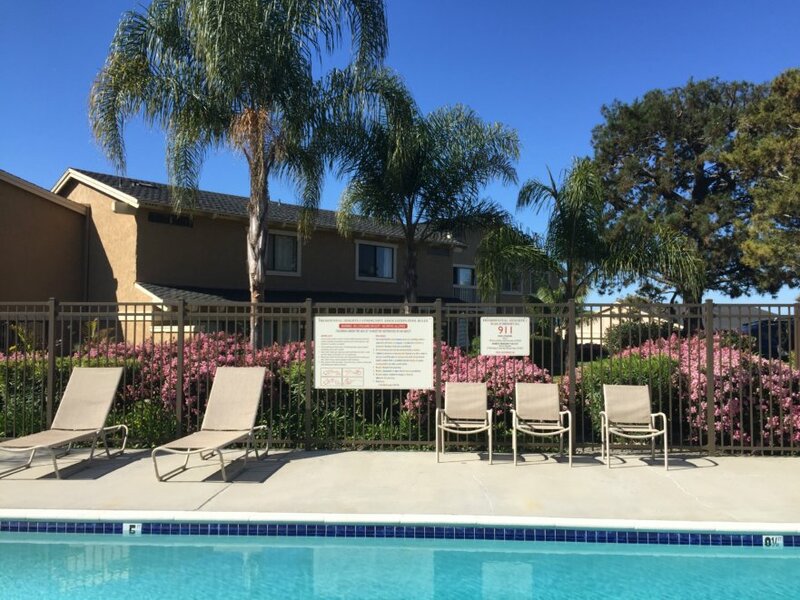 Pool Admission Signs—Admission signs are useful when pool usage is restricted to resident, guests, or people with a pool pass. Pool Hours—Hours and days of operation for the swimming pool. Emergency Information—Phone numbers for the nearest emergency services as well as the name and street address of the pool facility. Restroom Directions—If the restrooms are not visible from the pool deck, it’s useful to post directional signage to where the restrooms can be found. Food and Drink Restriction Signs—signs outlining specific pool restrictions regarding drinks, candy, tobacco, popcorn, gum, alcohol, or food of any kind. 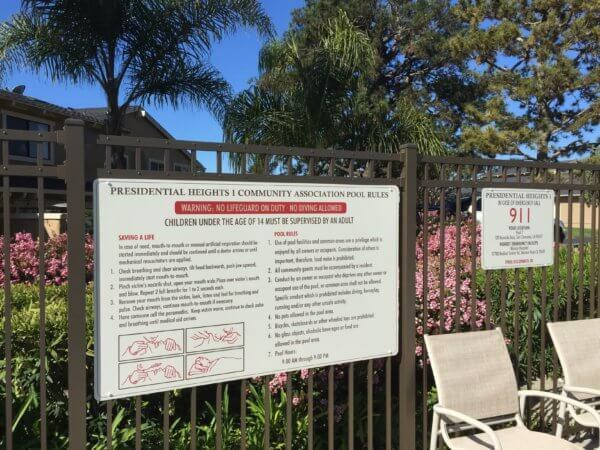 Required Signs for Commercial Pools in California, as outlined by the California Association of Environmental Health Administrators. User Capacity Signs—Pools must have a posted sign stating the number of guests permitted in the pool. This number, based on the pool surface area, is different depending on whether it is applied to a pool spa or a regular pool, but does not apply to wading pools. No Diving Signs—Any pool where water is 6 feet deep or shallower, a “no diving” sign must be posted in a conspicuous place. No Use After Dark Signage for Unlighted Pools—Pools that were constructed without required lighting must have signs prohibiting use of the pool after dark. 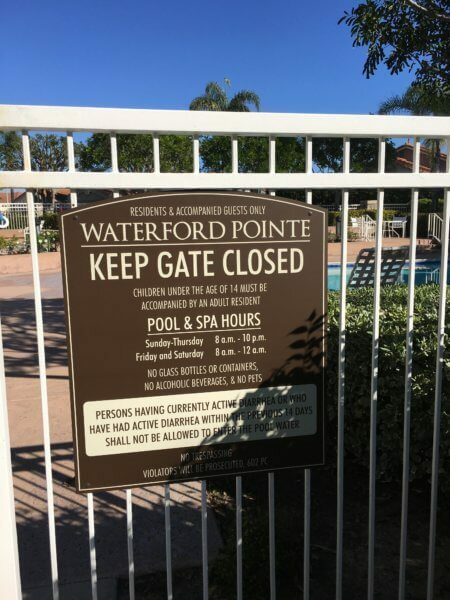 Gate and Door Signage—Signs stating that gates and or doors must be kept closed are required to be posted on entrances to the pool enclosure. Direction of Flow Signage—Direction of flow for recirculation equipment must be labeled and marked, and pools must also include clear labeling for vales and plumbing lines. Artificial Respiration and Cardiopulmonary Resuscitation Signs—Illustrated diagrams of how to perform CPR and artificial resuscitation procedures are required to be posted. Diarrhea Signage—Public pools must post signage restricting use of the pool by anybody with active diarrhea or anybody who has experienced diarrhea within the previous 14 days. Exit Signage—In any pool that uses automatic gaseous chlorine chemical feeders, all exits must me marked, and detailed evacuation instructions must be posted in sign form. Gaseous Oxidizer Signs—Any pool that contains automatic gaseous chlorine chemical feeders must include signs warning “Danger: Gaseous Oxidizer” and must include appropriate hazard symbols. These pools must also include “Turn On Before Entering” signs by the light and ventilation systems. Wave Pool Signage—The safety requirements for wave pools must be posted, as detailed in the California Health and Safety Code. Warning Signs for Spa Pools—Hot tubs and spas must have signage that states “Caution” and a number of additional warning signs including: warnings for elderly persons, pregnant women, infants and those with other medical conditions; posted restriction of unsupervised use by anyone under the age of 14; warning about hot water immersion while under the use of alcohol, drugs and certain medicines; and cautions about not using the spa pool alone. Emergency Shutoff Signage for Spa Pools—A tall sign posting the location of the emergency shutoff switch for a spa pool is required. This is a long and potentially overwhelming list of items, for sure. But the Starfish Signs and Graphics team knows not only which signs must be posted and where, but they are also well versed with the requirements of lettering sizes, and accessibility requirements for visually impaired guests as well. At Starfish Signs and Graphics, we customize signs and signage materials to meet the exact needs of our clients. Whether you have a specific look and chosen materials that you need to match, or you are looking for classy, professional looking signage solutions to help keep your guests safe while following the state regulations, we have the insight and experience you need to help guide you not only to compliance, but to beautiful signage at your property. To start the conversation about your pool signage, consult one of our designers today.